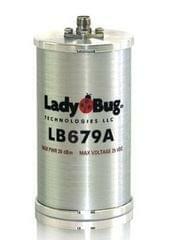 The LB5940A is a high accuracy True-RMS Power Sensor for general purpose use. The sensor utilizes a highly accurate, thermally stabilized, two path, RMS responding, square law diode detection scheme. The sensor makes accurate measurements on any signal regardless of its modulation bandwidth. The sensor’s patented thermally stable technology means that measurements do not drift and user zeroing & calibration before use are eliminated. Measurement interruption due to automatic calibration is also eliminated bolstering the performance and reliability of ATE systems. Unlike competitive sensors, it is never necessary to disconnect the source to zero your LB5900 series sensor. 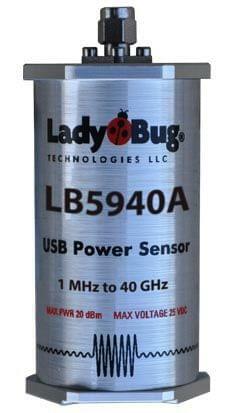 LadyBug’s PMA-12 Power Meter Software is included. The sensor is useful for research & development, manufacturing & service applications including radar, satellite, telecommunications, 802.11… testing, etc. The sensor features the industry’s most complete set of options for programmatic access and embedded applications. USB HID and USBTMC interfaces offer platform independent connectivity to most computers. The sensor utilizes standard SCPI commands and is compatible with competitive VISA IO libraries. Additionally, the sensors Persona capability allows emulation and compatibility with various VNA’s, Spectrum Analyzers, Sources and ATE systems written for other sensors. The sensor includes a rich set of triggering capabilities such as level controlled internal triggering, external triggering, delays, hold off and more.